For some reason, it looks like most of the CV Image inputs try to accept QCImage inputs (and then checkerboard the composition, since it's trying to operate on a fundamentally different object) -- not sure why that's happening, but I'm looking into it. For now, the best information would probably be from OpenCV itself. Its documentation and sample source are the only useful documents I've found. If you're not a programmer, these may not be very helpful though. I'll try to whip up some comments for the sample compositions in the next day or two to clarify. Thanks, some comments on your examples would be great! Here's the Video Track composition with notes showing the basic functional units. Here's a Brief document I wrote that describes what most of the useful patches do. It's not verbose, but it might help you get started. "Both provided demos require the GLTools plugin, and benefit from the YUV Colorspace plugin" What do you mean exactly ? there's a YUV to color patch in the graph (that generates a solid color), but no colorspace conversion (where images components would be treated as YUV instead of native RGB.) Working in YUV colorspace would allow for some speed improvements (as there is less data to process in YUV ), although HoughLines and FeaturesTracking (and FaceDetect) can be optimized by feeding Grayscale images (like you did in your example patch). What I meant is that the sample compositions make use of patches found in the GLTools plugin, as well as the YUV Colorspace plugin. For example, the feature tracking one draws points with GL Point, and the point color is determined by a YUV Color patch. Without these plugins, the demos won't work as expected. Can you explain what you were doing to get that? It looks like a real bug (not the PPC hangs from the video stuff like in the Alphas). What did you plug into the QCImage To CVImage patch? It doesn't necessarily divide the fps by 2, it depends on how big the image is and how fast your machine is. Mine (A 1.8ghz MB), for example, can do video->QC2CV->CV2QC->Billboard and still get ~100fps (80-120). Perhaps resizing the video to be smaller will help some for slower machines (especially when you do actual CV work, like feature tracking etc). Does the composition that crashed always crash, or was it just that one time? Can you e-mail it to me so I can investigate? But it was basically the houghlines compose with a movie plugged in the resize patch >QCImage to OpenCV... I was afraid that I think i have deleted the bilboard and was able to see the video...but it is late ...(it's impossible ?) I redo the same composition and it works (now i don't see the video without the billboard...:) yanomano. I'm not sure if this is the same problem, but I had it do the black screen thing this morning while doing some other testing. It happened when I plugged the video input into the QCImage2CVImage patch (a resize patch was between the two before). It went black/beachballed for a bit (thought it was going to crash), but then it kept going with no image. After closing it, the iSight light stayed on, and I had to kill VDCAssistant to get the light to go out. While it was on, no apps could use/see the iSight. with the opencv can i reconize an image from a model? You can detect different faces if you give CV enough training data to know the difference. I don't know much about facial recognition, so maybe Haar isn't the best algorithm to do this. I haven't made a way to train CV from QC. You need hundreds of images for it to work, so I figured it would be better for someone to use a separate application for that. please add the ability to clear the optical flow patch if possible. Maybe I'm not looking in the right place but where can I download the source code for this thing. I have done stuff with opencv before and maybe I can help. Thanks. Typically, betas don't get their source code posted (for a variety of reasons). I run into this too; I'd like to make a "toss lost points" option, if it's an ok thing to do. I'm not sure if the tracker can re-establish track points when it finds them again (something goes off screen temporarily, or something gets occluded temporarily). Worst case, I can track them internally, and just not export them I suppose. please please... i'm clearing results with a black swapping image, so it tracks 0 points... (and my structure is filled with nan, but not reduced to zero entry). The tracker does seem to remember tracked points (out of bounds), as even with a "pseudo-cleared" structure, some points DO seem to come back (on PAN shots for instance). Then, after a couple of hours running the patch (heavy use i must confess), my clear trick stops working, for an unknown reason (full buffer ?!). Anyhow, your GLpoint/line structure renderer is just a GODSEND ! after some fiddling, it seems that it is the auto-track node that can't toss points. I can clear hand-picked points, but not the auto ones. Any trick ? If the Clear feature is not an option on the CV side, do you think the GLpoint/Line patch could internally zap the nan. entries ? This is really exciting. Are the plugins and compositions Leopard compatible? I get lots of errors when trying to open them. These pluigns and compositions are leopard-only. The messages probably mean you installed them to the wrong directory. Please read http://kineme.net/HowToInstallCustomQuartzComposerPatches Before continuing. 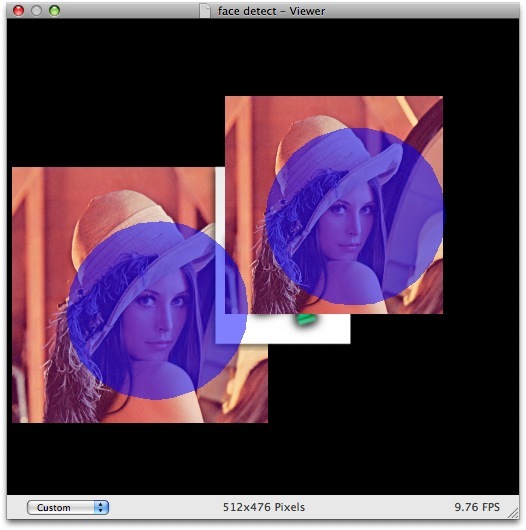 Another approach using the OpenCV Framework for Xcode? This approach will avoid to export the 150+ functions of the OpenCV library by just translating the I/O images. Moreover, it will allow to reuse the existing (written) code instead of cloning its functionality onto the QC graphic language. That's essentially what we're doing already -- we're not rewriting OpenCV, just using it and making QC wrappers. However, the OpenCV API is terrible, and the library is rather inefficient, so we're looking into alternative CV libraries. This project is great and i'm having great fun trying to implement a sonic mapping for it in SuperCollider. One thing i would really like to be able to do is clear all the points being tracked in "OpenCV Calc Optical Flow Pyr LK". I know there is a "Load trackpoints signal" input but this clears all the points and adds one - i just want to be able to clear everything in the structure. I'm fairly new to QC so there might already be a way of doing this(if so sorry), but if there is please share. I don't think this version supports that (oversight on my part) -- the next version (which isn't released in beta form yet... (could be soon though, now that I think about it)) supports this feature. if you'd like to give it a spin, drop me an e-mail, and I'll send it your way. Or, wait a week or so for me to prep it for another beta release. I've been using this patch extensively and I'd like to thank you for writing it. If anyone is interested I'd be happy to post examples. Can anybody advise on why I'm getting a 'Patch with name "KinemeYUVColorPatch" is missing' non-restoration message for this composition? I have the Kineme YUV Color plugin installed and the Patch Creator does indeed list a patch from Kineme named YUV Color. Do I perhaps need to rename the plugin or something? you're using an old version of the plugin (internally, the patch name changed from "YUVColorPatch" to "KinemeYUVColorPatch" to avoid namespace problems with future developers). The new version intercepts the creation of the old version, and automagically creates new ones in its place (so updating is automatic). This looks like someone saved a composition with the new version, which the old version can't use/understand (which is expected behaviour). hmmm. I re-downloaded YUV Color but I'm getting the same results. Could you take a sec and check the file in your download link? Either it's still the old one or I have other issues for consideration. Or maybe the new one isn't public beta yet? You probably have 0.1 -- up until a few seconds ago, 0.2 didn't show up in the menu (due to a misconfiguration I just noticed...). try 0.2, and it should work. it's working just fine now. Thanks for straightening out the menu. I finally found it just before you fixed it by opening the menu item in a new browser window. That exposed version two. Kris, thanks so much. This is slick! Does anybody try to use this OpenCV custom patch on Snow Leopard (Developer Preview)? When I open compositions, I got bunch of error messages like these. Macro Patch Cannot create node of class "OpenCVBGR2Gray" and identifier "(null)"
I've been using other custom patches without any troubles on Snow Leopard. I'm having the exact same problem. I've got several other custom plugins and patches installed and they work fine but the OpenCV patch doesn't seem to want to function. I had another problem with TuioClient.plugin too where it would simply quit QC on launch. I've tried both my home folder library and the root library (not the system library) but neither work. If there is any more information that you need, please ask as I just purchased the kineme 3D plugin and was hoping to use it with this on an upcoming demo project. You're using the old OpenCV plugin that was made for Leopard. That one will not work in SL unless QC is booted in 32-bit mode (do a "get info" on the app icon and click 32 bit more to run older plugins that haven't been compiled for 64 bit). However, the most current version of that plugin is CVTools, and should work fine in SL, and has some improvements. There may be some patches that have been eliminated from it, but they were largely pointless and shouldn't impact use. Go to the downloads page and download CVTools instead of what you have, long story short.